During this project, in which students from the animas community were fortunate enough to be able to design a new school. We were grouped with a variety of peers that ranged from Drivers to Analytical's, we created as a team a system of prototypes, within a project that was itself a prototype. We were grouped as a team with three or four other people. Students worked through stages of gathering knowledge and practiced skills that we would need to use during this project. We learned how to use sketch up and read a very difficult article about architecture and how it affects people. We were later tasked with interviewing all different types of users within our school, and using their personal values, to build a final prototype of a new school. 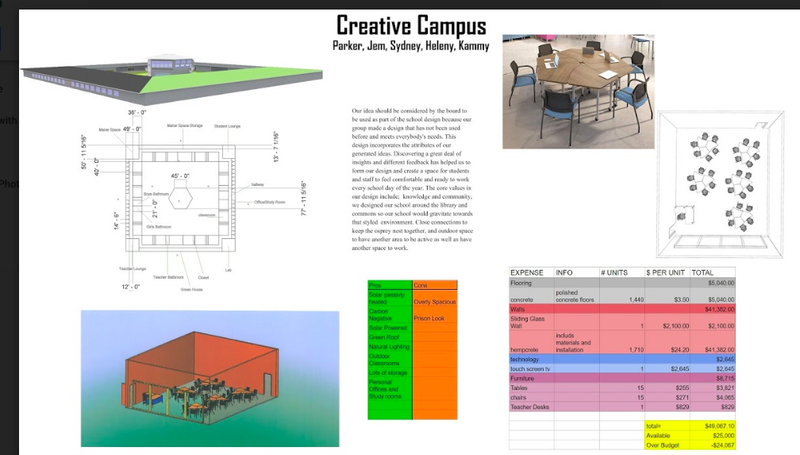 The final prototype had to include, a design proposal, a blueprint of your final campus design, a rendering of a shared space within your campus, a blueprint of that shared space, and a budget for a shared space in the school. I have learned so much doing this project, I have learned about proficient ways to build buildings, how to navigate in sketchup and as well as design thinking. I learned that through human- centered design process you are able to create a more sustainable and pleasing environment for a bigger majority of people. When you use human centered design, you are more connected and create better relationships with the people you are working with. I learned by using a human-centered design process you are able to create multiple drafts of a project and get feedback on those prototypes. By creating new prototypes using the values shown through those critiques. It is a critical way to gain perspective, if you are trying to create a project that is supposed to be beneficial to people. I also learned how to be patient with my group when they needed more time to complete a piece. The biggest thing that stood out to me for this project was how much freedom we were given. Even though, we may have more freedom this individual project led me to go on so many paths. Don’t get me wrong, I love freedom on the other hand, it isn’t always the best for group work due to everyone having distinct ideas that are so different. I wish we would have spent more time on our whole school design because I think the quality of our design would have been so much better. I think what played a major role was when we were having some technical issues with sketchup and we were stuck. One of our group members decided to go home and restart on the design as a whole. This helped a lot since it was the last computer the program was working on and by he taking it into his own time to work on it made the final product be turned in on time. They were a couple of days I had missed that period and my group was great working with me and helping me figure out what I had to work on. At the beginning of this project I was very worried and if my group would ever get anything done, but I think if I had to redo this project and was able to choose my group members I would have chosen the same group members. I believe it is important for students to have a voice in their education. To begin with I believe this project gives a perfect opportunity to have a voice about what classrooms and school design should look like. Another reason to allow students to have a say in what they are learning and how they are learning it because it is their education. Why go to school and be told how you have to do something when in the real life your choice is yours. Learning how to advocate for what is best for yourself makes you a stronger, happier person. This project helped me grow as a student that cares about their school and it’s image.